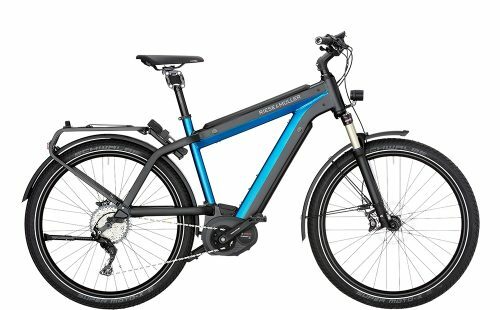 The Supercharger GT Touring from Riese & Müller is a simple, no fuss ebike for long and effortless rides. The GT version of the Supercharger is one of several in Riese & Müller’s range. Each one features stunning technology and unique design.The 2019 Supercharger now comes as standard with 2 x 500Wh Bosch PowerTubes. Both are beautifully and cleverly integrated into RM’s unique frame design. Riese & Müller is doubling the range of its electric bikes with dual battery technology. The Supercharger has the ability to charge both batteries at the same time. In addition, each battery delivers power to the bike at the same time also. Its dual battery technology puts Riese & Müller at the top of its class in terms of riding range. Most striking is its multi-award-winning design and its athletic features. The Supercharger models are like a six-pack cast in aluminium. A precisely-conceived geometry guarantee the ultimate in riding comfort. The Bosch Performance CX drive delivers above and beyond with its high torque. With a 2 x 500Wh batteries as standard, the Supercharger GT Touring simply keeps on going. With its tremendous, high-torque driving force and pedal assistance of up to 300%, the CX motor is capable of conquering any mountain and terrain. 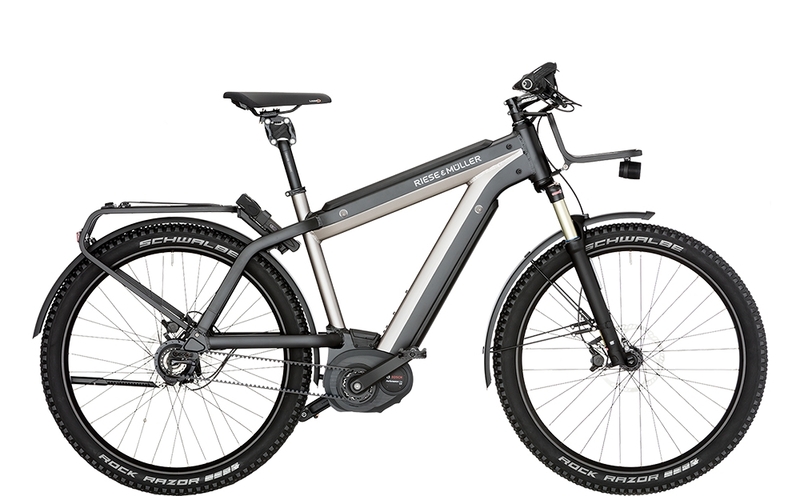 The GT version of the Supercharger offers Schwalbe Moto-X Fat Tires and extra-wide rims. Riding with low air pressure guarantees grip and traction, improves road holding and ensures sensational comfort rarely seen on a hardtail. Gear shifting is effortless with the sporty Shimano Deore XT 11-speed derailleur gear. Hydraulic Shimano Deore XT disc brakes never fail to impress with their braking performance. The Supercharger GT Touring comes with some nifty anti-theft features too. An ABUS Bordo Plus wheel lock mounted behind the seatpost prevents opportunistic theft. Both the ABUS and battery lock share the same key, which means you only need one key to do both jobs. However, new for 2019 is the option of adding either a Cobi Sport that enables navigation via a smartphone, and other features too. Alternatively, Bosch’s brand new Kiox display is a nice enhancement that’s available also as an option. Pleasing aesthetics are maintained via hidden cable runs under the top tube and through the frame. Furthermore, a Cane Creek Thudbuster ST suspension seatpost ensures ultra rider comfort. A set of Busch & Müller high intensity lamps front and rear ensure rider visibility at all times.